At our Trust, we want to ensure that inpatients and their loved ones have many ways to speak to someone who can help them resolve a concern. 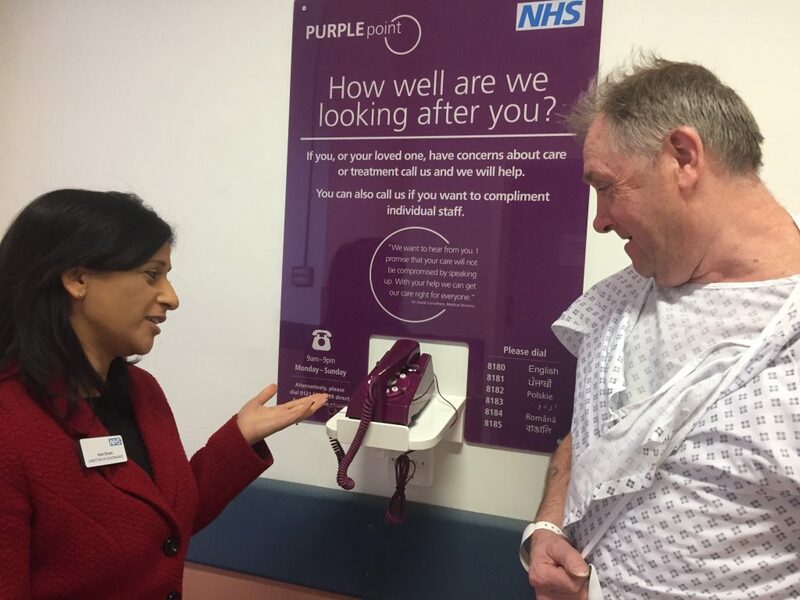 Working with our colleagues in Healthwatch Sandwell, we have introduced Purple Points across our hospitals. You can use phones at our Purple Points to call our advisors between 9am and 9pm any day and they will help. The aim of our Purple Point team is to help resolve your issues whilst you are still in our care, so that we can make a difference at the time, rather than when you have gone home. The team will also contact you to ensure you are happy with the outcome. Alternatively call us if you want to compliment individual staff, teams or services. Please ask staff where they are located if you cannot find one. Alternatively, you can call 0121 507 4999 direct from your own phone. We want to hear from you and promise that your care won’t be compromised by speaking up. To read our news story on Purple Point, click here.